Adsquare gathers data from a range of mobile, online and offline sources. This rich data gives a brand a stronger opportunity to create relevant campaigns for their audiences. It is critical to adsquare’s success that its data sources are reliable. 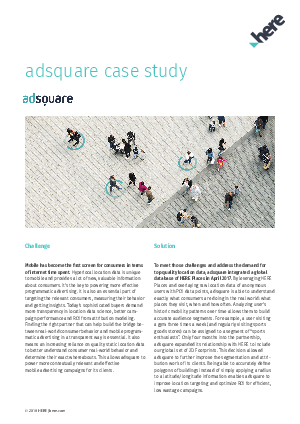 As the world’s leading location platform in 2018 (Source: Ovum and Counterpoint Research annual indexes) HERE is building and sharing real-time location intelligence with adsquare which reveals patterns to show how and why customers make transactions in specific places.